by Lou Jane Temple | Mystery & Thrillers | This book has not been rated. 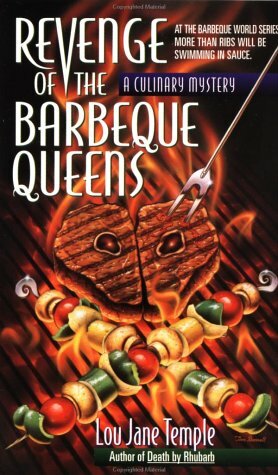 When Heaven Lee is judging the barbeque contest, trouble seems to stick to her apron. Although she's Kansas City's premier restaurateur and a helluva barbeque queen, this time around Heaven Lee is just a judge at the Barbeque World Series. But that doesn't stop her from getting in the soup. And that's just where Heaven finds herself when she discovers the upended body of champion barbeque cooker and giant pain Pigpen Hopkins sticking out of a potent pot of his extra-special secret barbeque sauce. Unfortunately, Heaven has had problems with the law before, and even though she came out clean, this is one sticky mess that's hard to explain. With the town up to its ears in high-rolling barbeque experts, the prize money is enough to send anyone gunning for the top spot. But when someone takes a shot at Heaven in the dark of night and then aims for a celebrated cookbook author, the competition is more than tough-it's murder. Going out in my "Girls Only" Book Box. Happy Travels. Took out of the Girls Only bookbox. I like this sleuth. This was a fun one and although I didn't know much about barbeque, I now know everything I ever wanted to know on the subject. And I had no idea there was so much variety. This is now on its way as a RABCK. Enjoy! Sounds like a romp! Thank you for this lovely RABCK.